Here are three poets from different periods who, while reflecting different historic sensibilities, are remembered as heroes whose words have transformed Iranian womens reality. The poet Padishah was a member of the Mongol Kutlugh-Khanid dynasty, who ruled in Persia and reigned over Kirman (in south-west Persia) in the 13th century. This dynasty was part of the Ilkhanate, one of the four divisions within the Mongol Empire. In the Ilkhanid period (1256-1353), both religious and secular arts flourished. Women of the elite class were accorded great respect, had a public presence, and were educated. Padishahs mother, Kutlugh Turkan, after the death of her husband ruled Kirman for 16 years, until 1282. She married Padishah to Abaka Khan, great grandson of Genghis Khan and son of Hulagu. Abaka did not live long, dying in 1282. Padishah, considered a prize for her beauty and ability as a poet, married again, this time to Gaykhatu, the fifth ruler of the Ilkhan dynasty and one of Padishahs former husbands sons. 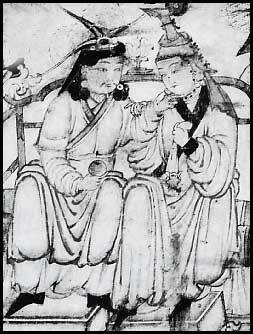 The marriage shocked the Muslims, although it was a relatively common practice among the Mongols. Upon her marriage to Gaykhatu, Padishah moved quickly to insist that her husband, known for his dissolute and extravagant ways, give her mothers old throne of Kirman to her as proof of his love. This he did, and Padishah became sixth sovereign of the Kutlugh-Khanid dynasty. Hulagu added to her power by granting her the powerful privilege of khutba (prayer for the sovereign) proclaimed in the mosques, the ultimate sign of legitimate reign. She also had gold and silver coins made in her name. I am that woman whose works are good. Under my veil is kingly power. where the idle westwind travelers cannot pass. from the sun that gads about in the marketplace. yet before the Lord my business is to serve. nor a hat make any head worth of command. when in its place would be a priceless crown? I am a ruler from the dynasty of Ologh Soltan. The Forgotten Queens of Islam, Fatima Mernissi. Women Poets of the World, Joanna Bankier & Deirdre Lashgari, editors. Illustration: Mongol Couple Sharing the Throne, 13th Century, Freer Gallery of Art, Washington, D.C.
Tahirih was a disciple in the Babi religion, a predecessor to the Baha'i Faith, which originated in Persia in the early 1800's. Baha'i has roots in Islam and is related in some ways to Sufism, a mystical form of Islam, although it is a separate religion. Tahirih was educated by her father, who was a mullah. Upon reading the writings of Shykh Ahmad-i-Ahsi, or the Bab (a forerunner of the Babi religion), she became a devotee and later was appointed one of His closest disciples. The religions positive views regarding the equality of men and women, and its drive to reform existing Muslim laws appealed to her. Tahirih was the only woman in the movement who became a disciple. Over the opposition of her father, she taught the faith publicly, claiming that the Bab was the fulfillment of the prophesies which pointed to the return of the Twelfth Imam. Using traditional rhyming forms, she wrote eloquent, ecstatic poems of love for God, as well as those deeply critical of the traditional clergy, whom she debated in public. Persecution inevitably followed. In 1848, during a conference at Badasht which was to proclaim the Babs elevation to Twelfth Imam, and during which leaders advocated reforms, Tahirih was supposed to have proclaimed it as the day on which the fetters of the past are burst asunder. She also appeared in public without her veil, a provocative act seen by the clergy as defiling both God and themselves. Some of her followers denounced this action as well. Shortly after she was arrested. Imprisoned under house arrest, she continued to preach. In 1852, she was sentenced to death as a heretic. It was then she proclaimed her most famous cry: You can kill me as soon as you like but you cannot stop the emancipation of women! She later was strangled to death. Tahirihs life and poems have been been retold throughout the years, most recently in public readings, a theatrical music drama, and a CD. In 1997 the Tahirih Justice Center was founded to address the acute need for legal service for immigrant and refugee women who have fled to the U.S. to seek protection from human rights abuses. Tahirih in History: Perspectives on Qurratul-Ayn, Sahir Afaql, editor. Tahirih: A Poetic Vision, translation by Hamid Hedayati and Bijan Yazdani, illustrations by Ivn Lloyd. 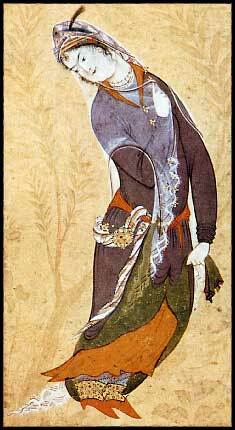 Illustration: 17th Century Persian Lady, Miniature, Museum des Kunsthandwerks, Leipzig. 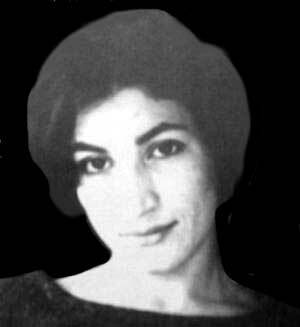 FFarrokhzad is a major voice whose work and life have influenced films, art exhibits, songs, and styles in twentieth century Persian literature. She came of age during the autocratic Shah Pahlavi regime. Educated in girls schools, she never received a high school diploma but at age thirteen or fourteen began composing poetry. In those years many Iranians were challenging traditional roles for women, who were expected to be modest in public, obedient, and, above all, not draw attention to themselves. In spite of more modern views, most women continued to be controlled by rules set by Irans traditional patriarchal society. Forugh herself suffered an arranged marriage at age sixteen, was divorced after three years, and then lost custody of her only child. According to Iranian law. she was never allowed to see her son again. By living by herself, and in 1958 forming an on-going relationship with Ibrahim Gulistan, a married man, she gained a reputation as being scandalous and immoral. During her years with Gulistan, Forugh studied film production and filmed documentaries, sometimes acting, sometimes producing, sometimes editing. As a result of one made about a leper colony in Tabriz, she adopted a boy from his leper parents. She also made trips to Europe, learning to speak and read Italian, German and English. Considered equally scandalous were Forughs secular views and promotion of the concept of female independence and right of women to assert their individuality. She rejected traditional Islamic dress in favor of tight western styles, and wrote often deeply personal poetry expressing female needs and sexuality. Some were clear protestations against Islamic law and Iranian social attitudes. Forugh spoke out against the destruction of individuality when communal roles led one to cling without question to tradition, even though at the same time she opposed the wholesale westernization of Iran. Some poems criticize women who sacrifice their individual potential and self awareness by taking refuge in the security that men offer, and who refuse to actively engage in the world around them. To Forugh, their inability to see past their immediate comfort makes them indifferent to the truly needy in Iranian society. As she became well-known in literary circles, Forughs unorthodox life fascinated some and repelled others. Some of her poems reveal her loneliness and doubts about doing the right thing. Certainly it took enormous courage for Forugh Farrokhzad to continue to write and live a life that suited her, not society. For this she is an inspiration today for women who follow her path. Forugh died, tragically, in an automobile accident at the age of 32. A Lonely Woman: Forugh Farrokhzad and Her Poetry, by Michael C. Hillman. And This is I: The Power of the Individual in the Poetry of Forugh Farrokhzad, dissertation by Dylan Livia Oehlet-Stricklin. Available on Internet. Middle Eastern Muslim Women Speak, Elizabeth Warnock Fernea & Basima Quattan Bezirgan, editors.